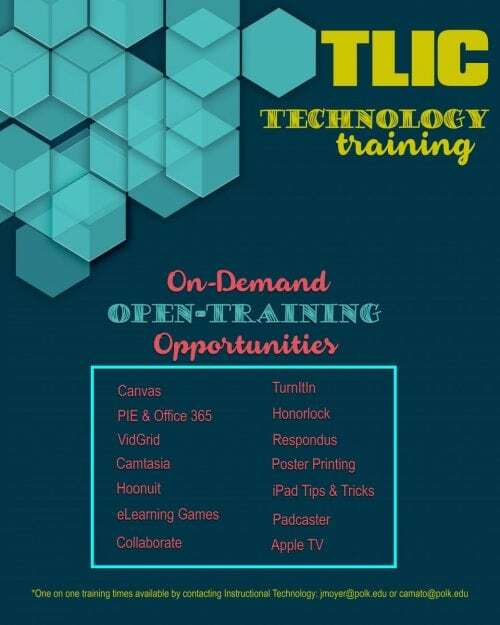 The Instructional Technology Department offers a variety of training for faculty and staff. The training sessions are offered face to face in the Lakeland TLIC (LLC 2269) and Winter Haven TLIC (WHC 143). Please note that we specialize in “just in time” training. The dates/times may not work well for you or your department; therefore, please contact your campus instructional technologist to find a date/time that will work for you. We want to know how we are doing. Please click here to access our evaluation form.